I spent most of the week recovering from having gone up north for the Labor Day weekend. The cats have reconciled with us and are back to being their normal selves. At work, my desk is still covered with paper, but I'm pretty sure I dealt with all of it minus filing it away. I'd have done that yesterday but just as I was about to begin I got email from our accountant with a lengthy request for documentation. My prediction is that I'll be working on that most of today. 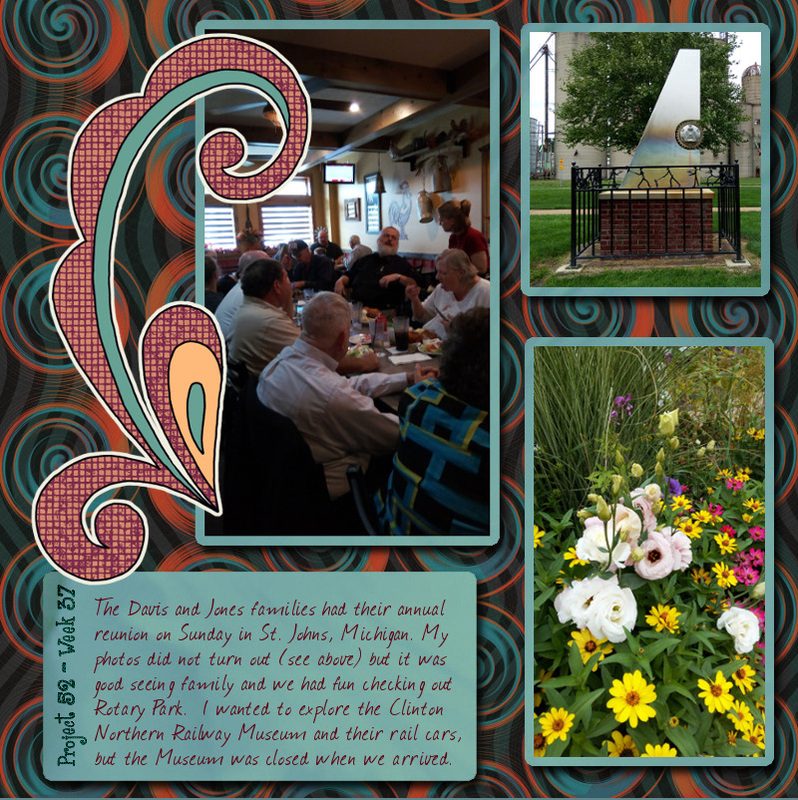 The big event of the week was going to St Johns for the Davis and Jones Family Reunion on Sunday. We were rested up for that excursion because my hopes of working of tackling our overgrown backyard on Saturday were thwarted by general exhaustion. We slept in a little, were up for a couple of hours and then went back to bed for another three or four. We got up again at 5 pm which left just enough time to go out for dinner, play some Ingress, and then come home, exercise, shower, and get ready for bed. This year rather than rent the township hall, we met at a bar/restaurant. We had more people attend than we had the previous year and that was good. I got to talk to my uncle Jerry (who was the first person I found back when I was trying to find my mother and who reminded me of that fact when we started conversing). I also got to see my cousin Cliff, who is always doing interesting things. He'd just returned from a 4000 mile motorcycle trip, from his home in Michigan, out to Colorado, and then back home through Michigan's upper peninsula. I know I talked to quite a few other people, including some I couldn't identify. In mom news, she's back at Mary Free Bed in Grand Rapids and is likely to be there for at least another week. She *sounds* chipper but her voice does not match the content of her words. She couldn't tell me what went wrong that ended up in the hospital and I wonder if she was so out of it at the time that she doesn't know how it happened. I have a feeling my brother Rob (who has Power of Attorney) took one look at her and called for an ambulance. He is really good about checking in with her and has called her first thing every day for at least the past ten years. He also lives fairly close by, so he can pop in to see her on a regular basis. jebra and I live three hours away and that's just not conducive to seeing her as often as I'd like. I don't know if this helps, but when my mom was having a physical therapist coming in he praised her for wanting to be independent as possible and wanting to be done with him. He told us that he had a lot of patients that toward the end of his time with them that they'd engineer a way to go back to the hospital so he'd keep coming. He said it was common. Hmmm. I don't really see my mom doing that, perhaps because I don't think she's healthy/with-it enough to be manipulative. Me though, I keep wondering if there is some way I could hire a good physical therapist under the table (cash-only, no insurance) to babysit me while I use the hospital's exercise equipment and ensure I'm doing the exercises correctly. I tend to lose count on the exercises I know how to do and my posture seems to need continual correction. I was surprised when he told us about people wanting to go back to the hospital. It sounded crazy, but when you mentioned that she was going back so soon I figured it was worth the shot. How's she doing now? That's an interesting thought. You should be able to hire someone to keep an on your exercise regime. Why not use your insurance if you have it? I think I would close the door to the backyard and ignore it until after winter killed it. I'm glad your brother is there to help care for your mother. I know that gives you some peace of mind. Knowing Rob is looking out for mom helps enormously. As for the backyard, that would work if the stuff growing were annuals. They're all perennials and will just come back even worse next year. I spent about six hours out there last Saturday and put a dent into what remains to be done. We went out for another hour and half last night and took down a mulberry bush. It was tree-height (say one and a half stories), three or four stems, and branched out over probably a ten-foot spread. I took the pruners to what came down and completely filled a yard waste bag and started another before it was too dark to do more. There's still a large pile of brush on the lawn but with all the mosquito-borne diseases out there I wasn't going to risk getting more bites or hurting myself by not being able to see what I was cutting.